We believe our main goal is to create reassurance for our customers in their time of need; creating something positive after the unthinkable has happened. This commitment to our customers has allowed us to become industry leaders in the restoration sector. Our professional yet innovative approach has allowed us to use the latest technologies for all types of fire, smoke and soot damage as well as flooding, escape of water and building drying. Our promise to our customers centres around five key principles – being responsive, experts in our industry, professional in everything we do, working together and always using the most innovative technologies. We pride ourself on our ability to give a rapid response to all our customers. Our 24hr service is available seven days a week, allowing our dedicated technicians to respond to your request quickly and efficiently. Our can-do approach means there’s no job we can’t manage. Our customers know that we can find a solution, no matter how complex the issue. We have spent over 40 years refining our working practices and developing industry-leading restoration and damage management services. We always are looking at new ways to improve our services and expand on the services that we already offer. We continually invest in knowledge and training and encourage our team to grow their skills. We have also started to impart this knowledge within the industry, offering valuable CPD training sessions for those who are looking to stay up to date with the latest developments. 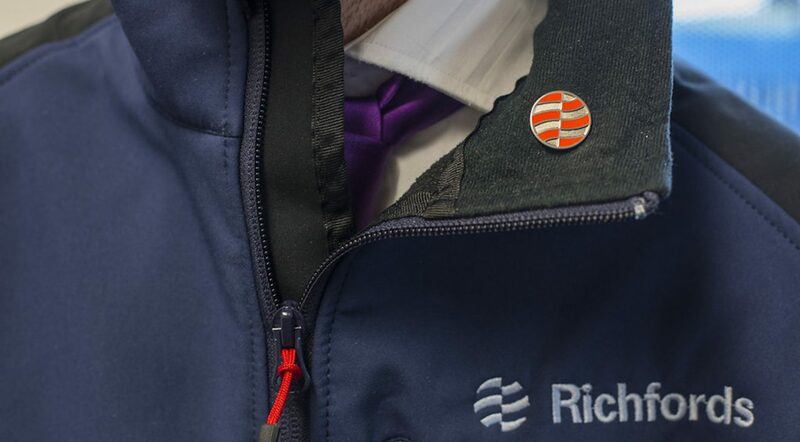 Richfords has built relationships with some of the UK’s main insurers over the last 40 years, due to our level of experience and professionalism. Our team are dedicated to ensuring the customer’s needs are always the priority. The nature of our work means we deal with each job with enormous sensitivity, whilst remaining positive on the outcome. We are specialists in high net worth and heritage insurance claims we regularly work in some of the UK’s most prestigious homes. You can trust Richfords to take care of you and your property. Togetherness is part of our ethos. We want to work together with the customer and policyholder as well as the insurers, loss adjusters and other parties that may be involved with a clam. We work hard together to ensure we deliver reduced claims costs and deliver excellent value in everything we do. Communication is key to this, and often means we go above and beyond to ensure the customer feels happy at every stage of the journey. We pride ourselves on developing new and innovative ways of reducing the cost of insurance claims, which also decreases the time spent on a project. Not only does this reduce the amount of time spent away from the property, it helps our customers to feel less disruption and stress. We’re always looking to create new equipment and use technology to improve our services.